There is nothing better than chocolate. Like strawberries, shortbread cookies or raisons. 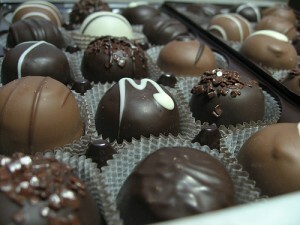 Chocolate is simply velvety, rich heaven. I need to write more about my love of chocolate. I was scraping the bottom of the chocolate barrel for a while but I managed to kick that habit. Fully recovered from my downfall, I now only eat the best. Am I a chocolate snob? Absolutely. Now why not head on over to Melissa’s blog to read some more creations inspired by the word ‘better’. * Photo credit to cacaobug via Flickr. You know what I love? Chocolate covered cherries! hmmmm…..
milk chocolate would be my preference…..mmmm…..